To begin with I was slightly confused as to what this was meant to be: lecture notes to a lecture that never happened, a “how to” book for magicians or an autobiography? I soon gave up worrying and just went with the flow and found it to be an entertaining mix of all three. Sean takes the stance that the reader is probably doing OK without his help but if you want you can read this anyway and you might find something useful. I must admit that to begin with, that was what I was thinking. But as I went through I found lots of useful points. Sean makes a big deal about constantly reviewing every part of his show from costume, props and even his name! We all see ourselves through rose tinted glasses. There are some great anecdotes about his journey in magic. He shares his ideas about repeat bookings and what the bookers are really looking for in a magician; it’s not about the magic! Noisy parents, every entertainer’s favourites, are discussed with a few useful insights into why they are talking and what you can do to minimize the disruption. Sean has worked internationally and has appeared on TV. Like most things in life, things that appear the same can turn out to be very different experiences and Sean paints a good picture of the idea and the reality of these situations. There are just four routines in these notes/ autobiography but they are all good takes on familiar tricks. I particularly like Dove Pan Change Bag and a Kid. 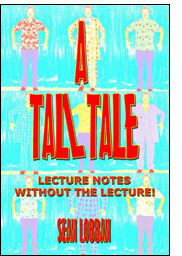 The best thing about A Tall Tale is his work on being a professional and all that it entails. If you take the time to read through it, it’s less than 100 pages, it won’t take long, and then have a review of where you are I’m sure we could all improve our bookings. I thought this was a worthwhile read even before I found out the price. At just £4.11 it’s a no brainer! Score: 4 out of 5 eggs.